For the past two years, a thickening, heating, drying atmosphere over Brazil has become the haunt of one of the worst kinds of atmospheric bullies. A blocking high that has parched an already wounded forest country, shrinking its reservoirs, turning rivers into ribbons, and threatening millions with a lack of access to essential water. The block feeds on heat and the building inertia of a warming atmosphere (see also Quirky Winds Fuel Brazil Drought). It is a new species of mutant weather animal bred by human caused climate change. Its ilk have ranged the globe setting off terrible droughts in places like Syria, California and Southeast Asia. But perhaps nowhere is the undoing of rain so strange and tragic as it is for water-rich Brazil. Amazon Rain Forest. The very name conjures the image of lush vegetation, of mists, of rivers of storms riding the thick, moisture-laden airs. A wet interplay of forest and atmosphere that has for centuries reinforced and amplified the cycle of drawing life-giving water down from the skies. But no more. Human climate change, a regional deforestation mafia, and the ogre of a blocking high pressure system gorged on heat steroids have put an end to that. For as of last week, reports from NOAA showed a rainy season 2/3 past and desperately dried and behind schedule (see image above). 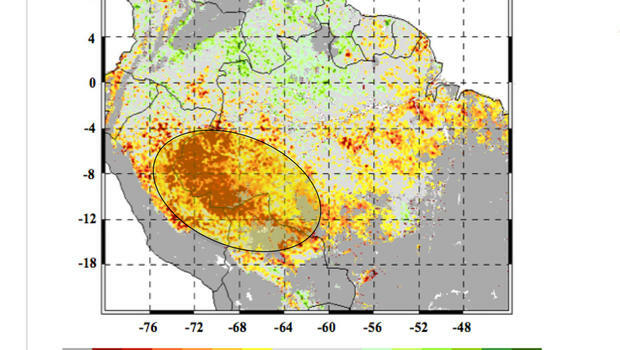 A ‘rainy’ season in which large swaths of Brazil and the Amazon Rainforest fell into the lowest percentile of years for moisture received. Will the Rains Briefly Return? For the Sao Paulo region, at the epicenter of the current blocking pattern and deforestation induced drought, 2014 was the driest year since record keeping began in 1930 (see Drought in Sao Paulo). 2015, so far has only seen slightly more water. And the slight increases in rains have only been enough to push Sao Paulo’s largest aquifer — the Cantariera — to 12.9 percent capacity, even when dead pool volumes are included (without the new dead pool volume, Cantariera would be sitting around 9 percent). With a little more than a month and a half remaining to a notably stunted rainy season, the Cantariera will be fortunate to hit 1/5 capacity by late April. A situation which could see the most populated region in Brazil desperately shy of water and continuing current rationing at least for the next year. However, a newly emerging Pacific El Nino may draw back on current moisture flows to the region, putting a lid on late season rainfalls and pumping up the blocking high yet again (see ENSO and Drought Forecasting). If the forecast rains do not arrive and the block again tightens its grip over the region, Sao Paulo could be looking at running out of water for many of citizens over a 4-6 month period. Regardless of whether a brief spate of rainfall provides new hope for avoiding a complete collapse of Sao Paulo’s water supplies for 2015, the long term situation looks increasingly dire. Added heat from human-caused warming combines with rampant deforestation in Brazil to create a kind of drought death spiral. Already baking under the heat of an equatorial sun, the clear-cut and burned Amazon is now struggling to retain moisture. Understory fires and gradually building heat due to human warming at the rate of 0.25 C per decade for the rainforest provide additional stress to a critical forest region. A recent report in The Economist estimates that 30,000 new trees would need to be planted to help rejuvenate the ‘flying rivers’ that continuously feed moisture to the rainforest (a very low number considering the fact that the Amazon contains an estimated 390 billion individual trees divided into 16,000 species). Deforestation, as well, would necessarily have to stop. And even if these two requirements were met, human caused warming would have to be quite mild to spare the Amazon conflagration and conversion to much drier savannah and grasslands. Given these dire challenges, it must be assumed that Brazil, much like the US Southwest and other regions of the world faces the prospect of potential megadrought over the coming years and decades. So what we are seeing for Sao Paulo now is, sadly, prelude. It’s Supposed to be Rainy Season in Brazil, So Where has all the Water Gone? Wow! Great work, once again. Thank you for another brilliant analysis, Robert. When forest cover is lost, runoff actually flows more rapidly to streams and can increase river levels. With deforestation there is no longer vegetation to slow down, intercept or evaporate the rain. The soil becomes waterlogged more quickly. Any excess will runoff. Also there is a higher potential for erosion since the tree roots are not available to hold the soil down. A deforestation mechanism that may reduce streamflow could be the following: when forests cover is lost, there are no more trees to release moisture (evapotranspiration) into the atmosphere. If there is less humidity in the atmosphere, this reduces the potential for cloud formation and subsequently there is less rainfall. This is a simple description, there are many factors and variables but a better understanding of the mechanisms can lead to better planning. It’s true. Add in the fact that pumping up the hydrological cycle through warming results in heavier downpours when rain does occur and you end up with a compounding impact. The Economist pieces states, “Some 30,000 trees need to be planted to undo the damage, experts reckon.” That figures seems extemely low, and so far have been unable to locate any study that corresponds with or corrects that number. Almost four hundred billion trees belonging to 16,000 different species grow in the Amazon, according to a new estimate. More than 100 experts analysed data from 1,170 surveys to come up with the figures, highlighting the extraordinary scale and diversity of the Amazon rain forest…. …roughly 6,000 Amazonian tree species have populations of fewer than 1,000 individuals. This would automatically qualify them for inclusion in the International Union for Conservation of Nature (IUCN) Red List of Threatened Species – if they could be found and identified…. Fantastic graphic. I also think the 30,000 number is a mistake. 30 million or billion, really. 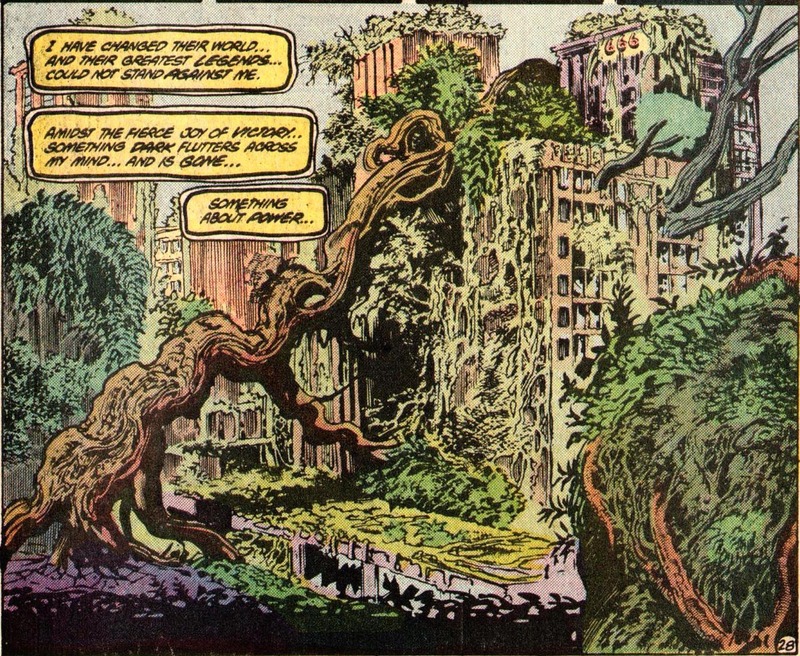 Artwork from Swamp Thing, #47, written by Alan Moore, illustrated by Stan Woch and Ron Randall, colors by Tatjana Wood. Highly recommended, along with all of Alan’s work on Swamp Thing. Thx, E-man. My wife was wondering where that fantastic work came from. You’re welcome. For context’s sake, it’s worth starting with Alan’s first ST issue, #19. DC Comics published most of his ST stuff in graphic novel compilations. 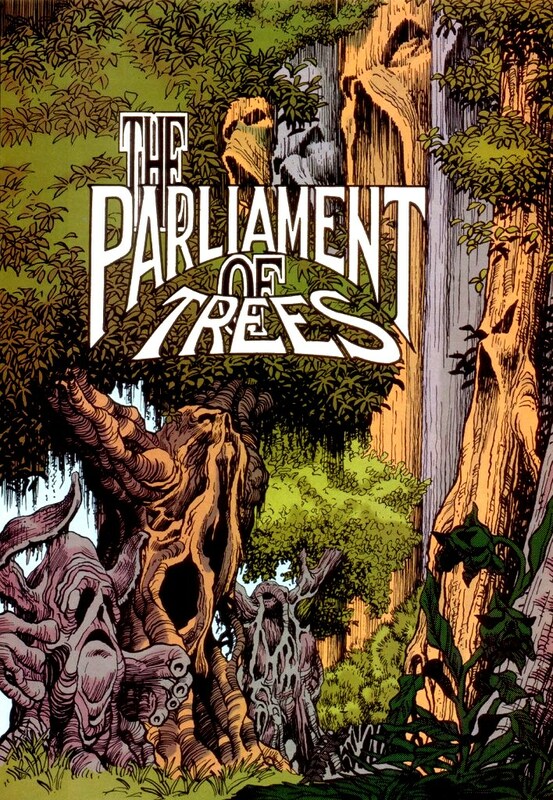 ‘Parliament of Trees’ appears in Volume 4, ‘A Murder of Crows’. Brilliant stuff; serious concern for the environment evident throughout. Yeah no way is 30,000 trees right. My guess is they meant 30,000 acres or even hectares (60,000+ acres)! Misinterpreting that as trees was probably a form of cognitive denial, because it is so immense. 30,000 acre/hectares can’t be right either…apparently 100,000 are lost each day. 30,000 acres is 1.5x the size of Manhattan. 30,000,000 trees seems a more logical number. That’d be roughly 8% of the total trees in the Amazon. 30,000 seems slender even in comparison with the number of trees in New York City. Standing trunk to trunk, New York City street trees would form a line 118 miles long–the distance from Manhattan to Hartford. Spaced 25 feet apart, New York City street trees would stretch more than 2,800 miles–all the way to Las Vegas. A large, healthy tree removes almost 70 times more air pollution each year than a small or newly planted tree. Any discussion of how many trees need to be replaced is probably moot. Most of the forest soils after clearcutting the forest canopy are probably leached of nutrients. Those hectares likely will not support forest biomass again for many generations if ever. Paul Stamets explains the principles of mycoforestry, which preserves native forests, recovers and recycles debris, enhances replanted trees, and strengthens sustainability of ecosystems. He describes methods of introducing certain species of fungi into recently logged or burned areas to aid in forest recovery, using native fungal species and matching them to the trees they usually partner with. When the mycelium eventually put up mushrooms to reproduce, those are eaten by birds and other animals, who further fertilize the soils and drop seeds from other plant species there, so the new ecosystem develops quickly…. I hear you however there are radical, clean solutions to all of the difficulties humans face due to human-caused climate change. Some of those solutions have yet to be discovered. Some solutions, as evidenced by Stamets’ great work, we already know about and can easily implement, if given the opportunity and funding. While growing many wood-decomposing mushrooms, my friends and I discovered the ‘wonders of cardboard’ for growing mycelium. Silky, diverging forks of mycelium would happily race down the valleys within the folds of corrugated cardboard. Having myco-mulched with cardboard for many years, I realized that cardboard could become a growth medium for encouraging guilds – communities – of fungi and plants symbiotically working together. Then, the epiphany hit me like a lightning bolt. Why not re-invent the cardboard box so each box becomes a designed ecosystem? If only we could manage most of our waste this way. A good way to envision a Life-giving way to live. Yes, seriously. Single-use water/soda/juice bottles ought to be packaged in an edible material, or at least compostable or biodegradable material. Q: draw back on? = restrict flows? or pull back in? Ever since 1989, when troops massacred hundreds of protesters around Beijing’s Tiananmen Square, China’s ruling Communist Party has built its legitimacy on a bargain with the people that is unspoken but universally understood: the Party promises economic growth, and citizens don’t make a fuss about the absence of democracy and the freedoms that go with it. But that bargain is changing. And there are signs of it, however subtle, in the drama surrounding a viral video that gripped the nation this past week. A Chinese documentary about the country’s notoriously bad pollution, “Under the Dome,” hit the internet on February 28. At first, some in government signaled support — it was good for citizens to care about their environment. The next question, of course, is: “Or what?” The Party, obsessed since Tiananmen with maintaining stability, doesn’t want to find out the answer to that — and its sometimes-contradictory responses to popular dissent and to pollution are, at base, driven by fear…. Attempted to make ^that^ point in the comments here a few daze ago. ‘The blocking of Chai Jing’s video is not so much about a lack of concern for environmental issues. Farmers growing Eastern Washington’s largest grain crop have seen a mild winter lead to an early growing season. Researchers at Washington State University say they’re seeing wheat, along with cherries, apples and other tree fruit growing several weeks ahead of schedule across the state. Of course one feature of farming in the Palouse country is that it is largely dry farming with no irrigation. Consequently, they rely on winter snow pack and rain. Could be a problem if things dry up. Well done, witsendnj. Beautiful gravatar, too. NOx is nasty… So are most FF byproducts. As California heads into its fourth year of drought, more communities are looking to tap into the ocean for drinking water through the process of desalination, which removes salt from seawater to make it drinkable. Proponents see the ocean as a “drought-proof water supply,” but desalination is expensive and critics say it’s harmful to marine life. David Jassby, assistant professor of chemical and environmental engineering at the University of California, Riverside, gives Here & Now’s Jeremy Hobson an overview of desalination. We then turn to Sandy Kerl of the San Diego County Water Authority, which is partnering with Poseidon Water on the Carlsbad Desalination Project in Carlsbad, California. When the project is completed this fall, it will provide more than 50 million gallons of drinking water a day to 112,000 homes in San Diego County and will be the largest desalination plant in the Western Hemisphere. I call that “hostage water”. It won’t be cheap. There is a 3 or 4 foot diameter pipe being plumped up the hillside from that plant (I’ve driven past the construction). When you factor in the plant operation plus pumping, that is going to be some seriously expensive water. A Norwegian company aiming to convert secondhand oil barges into floating desalination and wastewater treatment plants is recruiting Israeli ..
– I think desalination is “trending”? Guys, stop worrying about drought. The water is still there its just being relocated into the ocean. Joking aside, is this the start of something new or just el nino related. Good catch, Bassman. Looks like something to keep an eye on. Bassman i think you are totally correct and was something given quite a bit of coverage in Aus after 2011 in the wake of the massive Brisbane floods (which had nothing to do with climate change of course :P) I think from memory alot of the info came from this paper? Matt, yeah I think so. I also think the inc in dryness on land increases the surfaces temps during el ninos (temp positive feedback) in addition to all the added heat from the ocean surface. Either way, El Niño is the last thing South American forests need right now. I’ve read some pieces over the past few days regarding deforestation and it’s effect on rainfall (quantified). Similar knock on effects are occurring elsewhere as well, just not so quick / intensely. PNW (Oregon / Washington / BC) and Russian forest harvesting produces similar results regarding deprecated “fly rivers”. Sao Paolo gets the trifecta with the shift in air currents. There is so much that happens when these rainforest, tropical and temperate, are logged. In the tropics, the warm temps enable extremely active communities of microbial and invertebrate decomposers. Organic debris dissappears very rapidly and is mineralized in the soil. However, with the forest canopy removed, what rain does occur leaches the soil and the nutrients pour into the rivers and oceans. The soil is depleted and cannot support forest biomass again. That is why the slash and burn farming that occurs in the Amazon only yields a few years of crops. In temperate rainforest, like the Pacific Northwest, temps are cooler and the decomposer communities act more slowly. Hence, there is a build up of organic debris that forms a carbon layer that actually protects the soil from mineral leaching. It is like having a rain jacket laying flat on the ground. It is that greasy, almost black layer that you expose when slipping on a slope while hiking in the PNW. If a logging operation does not scarify that carbon layer, the underlying soils may be protected from rain. However, loggers relying on clearcutting, rarely accomplish that and the soil is exposed to leaching and erosion. With a warming climate, the PNW may get wetter but the warmer temps will also speed up decomposition. As a result, temperate rainforests may eventually suffer the same soil leaching conditions as tropical forests. Oh the tangled webs we weave. Paul Stamets believes mycelium are information-sharing membranes in their environments. He says they are aware, react to change, have the long term health of their host environment in mind, and devise diverse enzymatic and chemical responses to challenges. He cites research to back up these claims. In other words, he is telling us fungi are intelligent, sentient organisms. Because they regulate the flow of nutrients through the food chain, we can use them to bioengineer ecosystems…. Mycoremediation is the name Paul Stamets gives to the “use of fungi to degrade or remove toxins from the environment” by using mycelial mats. Fungi can be used to clean up mercury, polychlorobiphenols (PCBs), fertilizers, munitions, dyes, estrogen-based pharmaceuticals, neurotoxins — including DDT — dioxins, and stored nerve gas. Fungi can also break down oil spills, although several patents on some species are stopping the use of them for clean-ups, he tells us…. 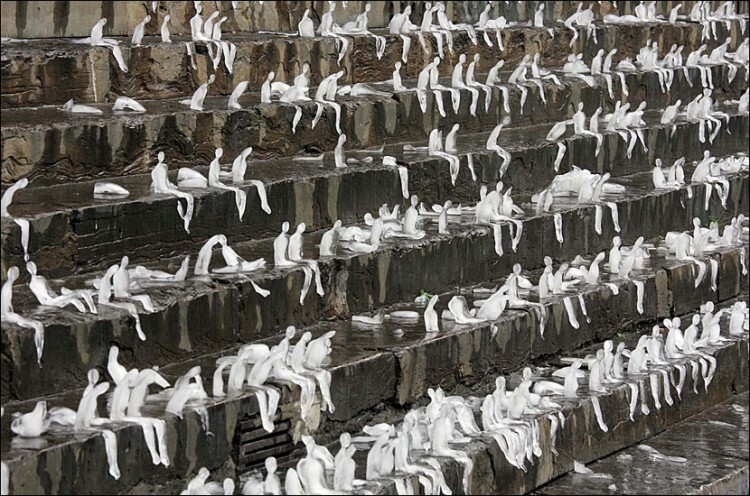 ‘To highlight the effects of climate change, Brazilian artist Nele Azevedo made a installation of 1,000 ice sculptures of sitting men on the steps of Berlin’s concert hall. The sculptures began melting in 30 minutes. …Since 2005, Azevedo has been setting up her Melting Men in various countries around the world. Although originally intended as a critic of the role of monuments in cities, environmentalists around the world are adopting her work as climate change art. Thnx! We like to show CC art in our town as a break from constantly haranguing people! You’re welcome. Joni, your wordpress user link doesn’t go to your page. You’ve a comma before the dot in your url. Pointing it out in case that’s not intentional. – From water hungry Santa Barbara, CA where I lived for 40 years. With no real relief in sight for drought-stricken California, Santa Barbara County received a $3 million life preserver this week from the state that will help pay for emergency pumping at Lake Cachuma. Water levels at Lake Cachuma have dropped to just 28 percent of the reservoir’s total capacity. As a result, the gravity-fed pumps are losing their ability to deliver water through the system. The lake’s elevation is now 688 feet. At 682 feet, the gravity-fed pumps cease working and the emergency pump would be turned on at the cost of about $100,000 per month, Ward said. – The other main source of water is Gibraltar Reservoir which has silted up from wildfire soil erosion. This will be the third drought in 10 years affecting Amazonia. Worth noting the feedback it will provide to climate change. “The UK-Brazilian team also calculate that the carbon impact of the 2010 drought may eventually exceed the 5 billion tonnes of CO2 released following the 2005 event, as severe droughts kill rainforest trees. For context, the United States emitted 5.4 billion tonnes of CO2 from fossil fuel use in 2009. The authors suggest that if extreme droughts like these become more frequent, the days of the Amazon rainforest acting as a natural buffer to man-made carbon emissions may be numbered. The video, created by NASA’s Scientific Visualization Studio, features the paths of 19 different satellites used by the agency to monitor conditions here on Earth — including the Cloud-Aerosol Transport System mounted on the International Space Station. …If I were to make investment decisions based on my assessment of the surrounding environment, it wouldn’t seem too insane to drop all of my oil and gas stocks and invest exclusively in alternatives. But that assessment would ignore one thing: the world is much bigger and way more diverse than my little corner of the world. Currently, the U.S. represents about 4.5% of the global population, and the country’s median income — about $50,000 — puts the typical American well within the top 1% of wage earners in the world. The bigger picture: These kinds of statistics can be applied to energy as well. Per-capita domestic consumption of oil is 900 gallons per year, more than 4.5 times the global average and close to 10 times the annual average consumption of the 5.8 billion people living in the developing world…. Global population is estimated to grow from 7 billion to 9 billion in the next 30 years. Gross world product — GDP for the planet — is expected to grow from $75 trillion today to close to $160 trillion by 2040. This means that transport of goods will increase immensely.The world’s “middle class” — those with purchasing power between roughly $15,000 and $36,500 annually — is forecast to grow from 1.8 billion today to 4.8 billion by 2030. Lay of the (much larger) land: Yes, oil consumption in the developed world is expected to decline as more fuel-efficient and alternative fuel vehicles hit the market, and that technology should curb some potential oil demand in the developing world as well. Even so, the most conservative estimates indicate the need to increase oil production by 10 million barrels per day by 2030 to meet the demand from these demographic changes mentioned above. Some estimates say it could require up to 25 million barrels per day of additional production. Meeting these needs, along with replacing the decline of existing oil wells, will require immense amounts of investment on development of new supplies. The International Energy Agency estimates producers will spend close to $23 trillion to maintain and grow production and to build out the infrastructure to handle that additional capacity by 2030…. There is plenty of oil and gas in the ground to meet this demand — heck, the United States alone is sitting on trillions of barrels of potential petroleum. The real challenge is that it is not yet technologically possible nor economically feasible to access all these sources. We may be headed for a time when you and I drive super efficient or alternative energy vehicles, but it’s going to take the rest of world a long time — and a lot of oil — to get to where we are. What this “Investing Fool” believes: It’s tempting to observe the world around us and make assumptions about the future, and sometimes it can be profitable. When it comes to investing in energy, though, investors must be cognizant of the fact that the world is much bigger than our surroundings. Otherwise, you might see today’s oil prices along with slumping demand here at home and assume investing in this space is a waste of money. That couldn’t be any further from the truth. Standing ovation to Robert, Commenters. And todaysguestis, thanks for the great David Barber presentation. ART+CLIMATE=CHANGE 2015 is a festival of climate change related arts and ideas that will include over 20 curated exhibitions alongside a series of keynote lectures and public forums featuring local and international guests. These stimulating events will attract a broad audience and provide a clear space for the discussion of the challenges and opportunities, impacts and solutions, arising from climate change. ART+CLIMATE=CHANGE 2015 will be staged in Melbourne from 11 April to 17 May, with further participation from museums and galleries located in greater Melbourne and regional Victoria…. Stay tuned for more announcements about ART+CLIMATE=CHANGE 2015 by subscribing to the CLIMARTE newsletter on our home page. “If the team’s Coulomb model is correct, it could have important implications for predictions of ice loss in Antarctica as a result of climate change. Indeed, for any given increase in temperature, the model predicts a bigger change in the rate of ice loss than is forecasted in previous models. “We predict that the ice sheets are more sensitive to perturbations such as temperature,” Tsai says. Hilmar Gudmundsson, a glaciologist with the British Antarctic Survey in Cambridge, UK, called the team’s results “highly significant.” “Their work gives further weight to the idea that a marine ice sheet, such as the West Antarctic Ice Sheet, is indeed, or at least has the potential to become, unstable,” says Gudmundsson, who was not involved in the study. Glaciologist Richard Alley, of Pennsylvania State University, noted that historical studies have shown that ice sheets can remain stable for centuries or millennia and then switch to a different configuration suddenly. Good one. Also posted yesterday by Colorado Bob, in the ‘Methane Release’ article. Regulators in California have told oil companies and drillers to stop operating 12 wells within 500 feet of underground water supplies out of concern for public health. The order from the Division of Oil, Gas and Geothermal Resources affected several companies, including Chevron, drilling for oil in Kern County using injection wells…. Well, we’ve just completed two pseudo-recovery years. Typical past melt trends would statistically indicate a return to lower levels, but not major new records. Considering the same statistical analysis, we’d be looking at 2017, give or take a year. However, the warm water pool in EPAC, the new record lows near the start of melt season, major export through both the Nares and Fram and a warm air invasion that is shifting toward Siberia all bear watching. Over the coming days, AO will probably shift negative and polar amplification will fade. The record lows in sea ice will likely begin to subside a bit. Beyond this variable swing, we’ll begin to see how rapidly the melt trend begins to take hold. All that said, this melt season start/near start is at a low launching pad for overall coverage and that bears watching as we proceed. “Over the coming days” like in a week and a half, the sun will rise over the north pole and stay up 24/7 for the following six months. It will be shining on a very loose slushy mess of sea ice–not your father’s (or even your slightly older self’s) sea ice. But weather conditions will, as always, play the greatest roll in the seasonal melt. As you say, we are certainly starting out with a low launching pad. Now I just need someone with better math chops than I to plug in this season’s numbers to Dekker’s formula to get an estimate for this years melt. Takers? Might be a good idea to look at a comment posted by Rob Dekker on ^^^that Neven post. I think the snow/sea ice model correlation is useful to consider. However, changes to the snow itself (water content, temperature, increasing rates of snowfall due to added moisture etc) also may have an impact. In addition, there’s a tipping point for a warming Arctic Ocean (and surrounding waters Pacific/Atlantic to consider as well). So many variables. Parsing the complexity is at least a bit of a lot of work. Great job distilling the complexities, Robert. Trying to keep up. And the soot from fires another factor, I suppose. Good points all around. I think though that Dekker’s formula is for snow cover in June, so it won’t be useful for a while. We are currently at about neutral as to snow cover anomaly. Another visual on the drought, soil moisture. Most of the Amazon is under this drought. Not at all Robert. I/we owe you for creating a place to feel comfortable and valuable as a climate hawk nerd. 🙂 I just recalled you posted some of the links/graphics I used. And these are both stark and stunning references to what’s going on in Brazil. Yes strange, but, as Masters points out, the sea surface temperature does not seem to be a driver of these systems but rather reduced wind sheer allows them to form. If I find anything I’ll post but I assume that if Masters says there’s little or no research on the subject then its open to speculation how climate change may be impacting wind sheer in that region of the planet. Warming generates a more static atmosphere. A more static atmosphere has lower wind sheer. Increasing troposphere heights would also tend to reduce sheer. The falling temperature differentials between poles and mid latitudes likely also plays a part. Thanks for this reference, Greg. wili: I remember the snow cover correlation claim. Don’t remember the source. Snow cover data I get from Rutgers Snow and Ice Lab. wili: (I don’t know how to link) but does this help? Good point. And that will somewhat depend on cloud cover and heat content within the snow. I’m more generally interested in the ocean and atmospheric dynamic, though. I want to see how big the negative AO bump is. In any case, we’re in rough territory from the extent perspective at this time of year. – Population increase trending in Persia as the planet’s ability to sustain them shrinks..
Iran’s parliament is expected to impose a ban on vasectomies and tighten abortion rules, and to restrict access to contraceptives. The moves are part of a stated drive to raise the country’s population from 77 million to 200 million. Two separate bills are being considered by the country’s parliament. One, meant to increase fertility rates, will ban surgeries intended for permanent contraception, except in cases involving serious threats to women’s health. Strict punishments will be imposed on doctors found to be involved in such surgeries after the proposed ban. State funding for birth control programs, which previously provided subsidies for modern contraceptives, will be abolished. The second proposed legislation would make it a real challenge for women to seek divorce, Amnesty International wrote in its report, citing provisions of the law, which, it says instructs employers to prioritize married women with children when hiring for certain jobs. The supreme leader has repeatedly urged Iranians to help increase the country’s population, which he described as aging. “If we move forward like this, we will be a country of elderly people in a not too distant future,” Khamenei said in October, according to the semi-official Fars news agency. “Why do some [couples] prefer to have one … or two children? Why do men or women avoid having children through different means?” the Iranian leader wondered. Why are couples having less children? Because in the current day it’s tough to support multiple children anywhere, especially in Iran. Under this ill advised policy, Iran will face rising poverty, then hunger… Add in climate change stress to crops and this issue becomes a stress that occurs sooner rather than later. – Or are they thinking? They might be thinking, but they certainly aren’t paying attention. Iran is feeling stressed, caught between a rock and a hard place: ISIS and USA. … The United Nations’ Food and Agricultural Organisation reports that the haul of Caspian kutum (mahi sefid), one of the most common fish, decreased from the 1950s to the 1990s from 1,250 tonnes per year to 210. Two main reasons have been given: overfishing and pollution. The Caspian Sea, shared between five countries – Iran, Russia, Azerbaijan, Kazakhstan and Turkmenistan – is in “critical condition” with oil tankers alone dumping over 120,000 tonnes of pollutants annually. Sewage from cities bordering the sea exacerbates pollution. Those waters are also very warm and low-oxygen now. Overfishing + high nutrient flow into the sea + warming is a killer combination. OMG and to think this was a cradle of civilization. Well, I just hope they don’t make themselves a textbook example of civilization collapse. Seems they’re heading in that direction now. All those cradle civilizations collapsed because of overshoot. How many less people do you think that region could support without fossil fuels? They’d do better with renewables. Less water stress. … A decade ago, the three lakes comprising Hamoun’s wetlands covered 5,600 square kilometers, the size of Utah’s Great Salt Lake. They served 420,000 people, two cities and 935 villages, EPO says. Today, only a few shallow patches of water remain. “This is it, there’s nothing, it’s empty,” said Ali Owsat Hashemi, governor of Sistan-Baluchestan, pointing toward an endless arid horizon. The drying has almost doubled seasonal dust and sandstorms from 120 days a year to 220 days, increasing respiratory, heart and intestinal illnesses and rates of cancer, according to a 2014 report published by EPO and the United Nations. It’s a fate mirroring that of Urmia, 2,100 kilometers to the west. Once the Middle East’s largest saltwater lake, it’s now 20 percent of its former size. Salt-infused winds blowing across barren sections are causing “serious” local health problems, according to the UN Development Programme. Urmia’s devastation gained the attention of President Hassan Rouhani, who has pledged $5 billion for recovery works. Officials say early efforts may be paying off with water levels in Urmia beginning to recover. How much is unclear. Ninety percent was dry in 2014. And, either way, lakes and reservoirs will silt up as part of the cycle. That’s one way to raise the water level. Why are all those big trucks dumping boulders into Lake Mead? Back to Brazil. Deforestation, at once reversed, has now accelerated significantly under the new government, is critical to fully understanding the drought and even to understanding precipitation patterns in North America. “If you keep clearing the Amazon, you’ll end up with there being a permanent drought, not just a one-year thing. You’re not going to have that transport of water vapor to Sao Paulo…There are also connections to North America and other parts of the world as well, so deforestation would have some effect on rainfall in North America in important agricultural areas in the Midwest, for example. Increasing (circles) and decreasing (triangles) precipitation result from complete deforestation of either Amazonia (red), Africa (yellow), or Southeast Asia (blue). Boxes indicate the area in which tropical forest was removed in each region. Numbers refer to the study from which the data were derived. “Over the centuries, there have been occasional forest fires. Studies looking at charcoal in the soil have shown that there have been four mega forest fires in the past 2000 years, so it is more or less one every 500 years. 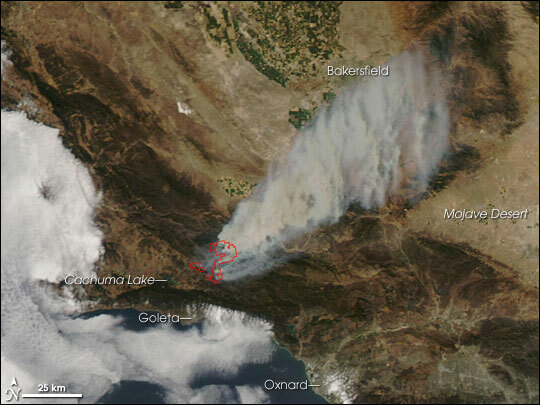 But now fires are happening far more often, generally during big El Niño years. 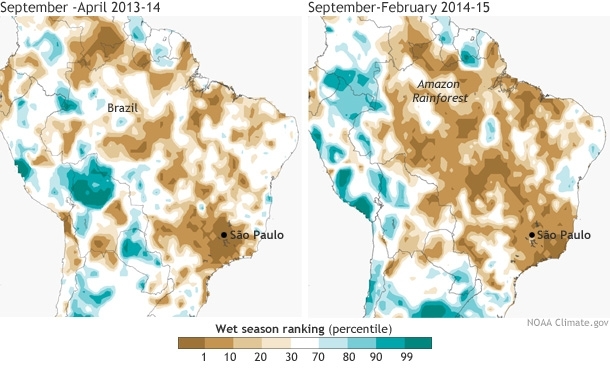 El Niño leads to drying, especially in the northern part of the Amazon. It happened in 1982, 1997, and 2006. We had destructive forest fires in the northern part of the Amazon. Now we have another phenomenon that has increased even more quickly than El Niño — though El Niño has increased a lot — called the Atlantic Dipole. El Niño is caused by warming of the surface waters in the Pacific Ocean. The Atlantic Dipole is a warm patch of water in the tropical part of the North Atlantic. It results in drought and forest fires in the southwestern part of the Amazon, in Acre state and neighboring areas. This happened in 2005, and then five years later again in 2010. You have water warming in this part of the Atlantic that has traditionally been [cooled] by a lot of dust in the air, much of it coming from the deserts in Africa and industrial pollution in Europe. The dust has functioned as a kind of shield — some of the radiation from the sun hits these dust particles instead of hitting the water. With global warming, you have more rain globally and that is cleaning the air of the dust, so more of the sun’s energy is actually reaching the water and warming it up in that part of the Atlantic, and it leads to droughts in the western Amazon. On a lighter note. If you want to mitigate climate change, support renewable energy, and make some money with money you may already have in retirement savings! you can now, or very shortly, move retirement money into funding for bonds for SolarCity’s innovative solar installation financing models. Their $1000 bonds that yield up to 5.45% can now be purchased through American retirement accounts in an announcement they made this Monday. Yay! Radical solution to a radical problem. Good going, river hunter Adriano Sampaio! Sampaio gave up his job as an insurance salesman last year, after 20 years, to devote himself to environmental activism full-time. As we stand on a piece of wasteland above the park, taking in the view across Pompéia, he expounds on the urgent need for reforestation, and on the subject of “linear parks” alongside rivers and streams, which create lakes, ponds and bodies of water capable of retaining stormwater and rainwater, as well as places for people to sit, walk and cycle in peace. The short (72 min.) documentary ‘Lost Rivers’ is worthwhile; trailer below. Once upon a time, in almost every city, many rivers flowed. Why did they disappear? How? And could we see them again? This documentary tries to find answers by meeting visionary urban thinkers, activists and artists from around the world. By 2020, an estimated 60 million people could move from the desertified areas of sub-Saharan Africa towards North Africa and Europe. By 2025, up to 2.4 billion people across the world may be living in areas subject to periods of intense water scarcity. This may displace as many as 700 million people. By 2050, 200 million people worldwide may be permanently displaced environmental migrants.